A good scenario, a pleasant environment … and good food. These are the necessary ingredients for the success of a good evening. Our Chefs have prepared for all of you a gastronomy based on traditional Mediterranean cuisine but with distinctive points needed to turn it into an exceptional cuisine. The kitchen of Masia Can Ametller is a creative Mediterranean cuisine that always offers delicious suggestions. Check our coffee breaks, lunch and the menus for groups. Do not disappoint! In our offer you will find a tasting menu that lets you enjoy the best of our menu. The periodically gastronomic days are journeys during which our culinary s’ expands according to seasonal produce. 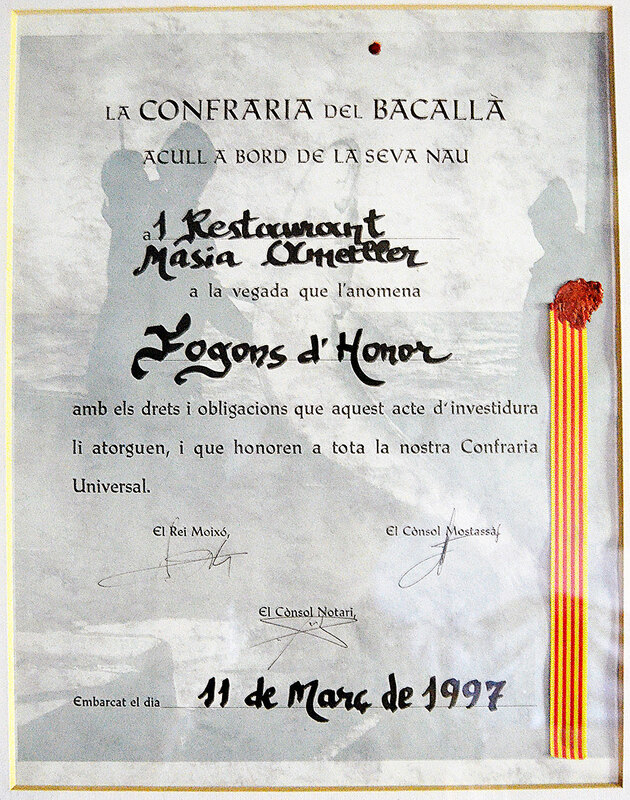 Our restaurant holds the honorable mention “Plates of Honor” of the Brotherhood Cod since 1997. We are very proud of this statement and we continue taking care every day that this product is an important part of our culinary.